The family of Freddie Gray held a peaceful and moving memorial service for the 25-year-old Baltimoreman at New Shiloh Baptist Church on Monday morning. Few would have expected that after such an affair, just blocks away, would be a scene of unrest that the city hasn’t seen since the tail-end of the Civil Rights Movement. As the nation peers from the outside at the ongoing situation in the streets of Charm City, nothing seen onscreen could possibly capture the tension felt on the ground. Amid the agitated voices of the youth, the booming voices of activists, and everyone in between, there was an almost universal understanding of the frustrated outbursts that took place Monday afternoon and raged into the later hours. NewsOne traveled towards the northwest section of the city near the intersection of North and Pennsylvania Avenue. Police were warning most media outlets to stay away. In the midst of the chaos swirling about, there were many good stewards who shuttled some of the media off to safety. Just a few blocks away at New Shiloh Church, a collection of religious and community leaders held what they billed as a “Peace Walk” at 7:30 p.m. towards the area where young people clashed with riot squad officers. By the time of the walk, police moved into the region to quell much of the clashing. We spoke with several individuals at the end of the Walk, some of whom were part of the youth that admittedly threw rocks and set fires throughout West Baltimore. Singer and author Verona Douglas of Baltimore attended the Walk with her daughter and young granddaughter and shared with us her thoughts on the youth’s response to Gray’s mysterious death. Douglas’ daughter added that much of what happens in Baltimore feels like a systematic plot to not only keep Black men from prospering, but to break apart the bond of the Black family. Her statement was met with an enthusiastic chorus of cheers behind her. NewsOne also spoke with Pastor Daniel Ettienne of Rev. Dr. Jamal H. Bryant‘s Empowerment Temple, who shared an understanding with the protesters of the day. “Dr. 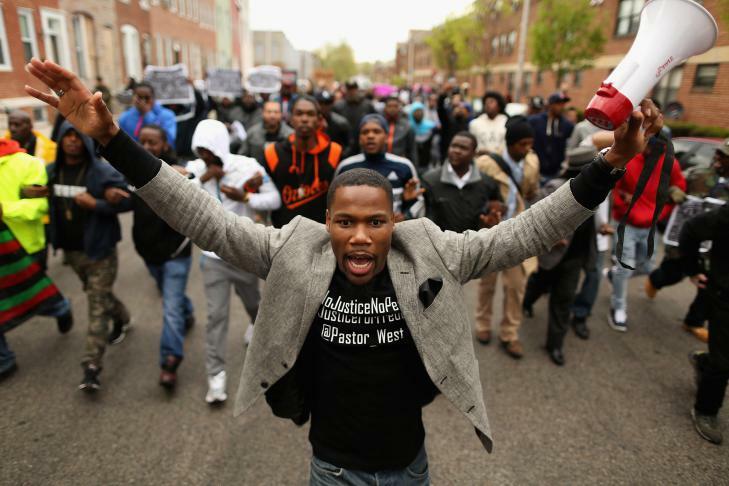 Martin Luther King once said that riots are simply the cries of the unheard, and so these young people are reacting over the loss of the Freddie Grays not just in Baltimore, but all over the nation. It wasn’t just the violent outbursts, but we had our young people marching in step with peace in their hearts,” he said. Pastor Ettienne, like many of the interfaith collective of pastors, reverends, and imams who marched Monday, didn’t chastise the earlier protests and instead offered compassionate advice. At one point, several older gentlemen shouted to the younger protesters that they understood their pain, but that destroying Baltimore won’t honor Gray’s life. Later, several of the older leaders embraced the young men in a bid to calm their visible anger. Just as the Peace Walk was coming to close, a car was set ablaze a block away, as the crowd was ordered to disperse. Amazingly, people calmly walked by the burning vehicle as if they were numbed as a result of what occurred earlier in the day. Leaders at New Shiloh say that they will meet again at the church on Thursday, April 30.